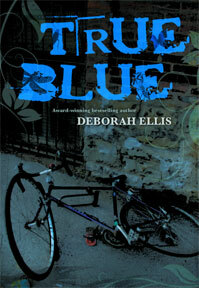 Mrs. Ashby is Reading… True Blue! This is an amazing book that pulls you slowly into Jess’s mind. It wasn’t until fairly far into the book that I was struck by Jess’s character. It’s difficult to describe without giving away too much because the joy for me was when I realized what the author was doing and began to squirm a bit in reading Jess’s words. Read it! Ellis explores the courage it takes to stand up for a friend in a town shattered by a murder. Jess’s best friend, Casey White, has ambition and passion. A budding entomologist, she seeks an adventurous life outside their small town. So when Casey is inexplicably arrested for the murder of a girl at a camp where the teens are counselors, Jess feels incredibly alone. The townspeople are quick to assume Casey’s guilt. While Jess’s mother (a woman with a mental illness) demands a call to action to release Casey from jail, Jess says nothing to defend her best friend to her cruel and small-minded classmates. Jess wants Casey to be exonerated and goes so far as to dream up an escape plan but, in the end, she fails to come to Casey’s aid and actually helps the prosecution build the against her. Ellis’s masterful novel makes every word count, thus highlighting Jess as a deeply conflicted, not totally reliable, narrator who is so afraid of losing the only part of her life that she values–Casey–that she doesn’t realize how much her actions have cost her. A compelling and moving read, True Blue is about the courage to believe in oneself and fight for what’s right, even when it is the hardest thing to do. A book worthy of any school curriculum. Click her to read full customer review.